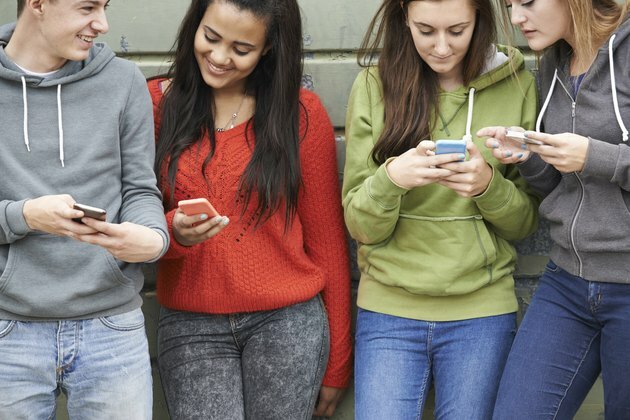 How Do Cell Phones Negatively Affect the Health of Teens? Cell phones are an addiction for many teens. From sleep deprivation to texting and driving, cell phones present a health hazard for teens who cannot break away from the social pressures of constant contact via cell phone. Sometimes, teens replace traditional social skills with text messages, voicemails and pressure to remain available through the cell phone at all times. This pressure can cause undue stress and anxiety for teens with a large social circle. Many teens are compelled to sleep with their cell phones nearby in order to respond to calls or text messages. According to Science Daily, many youngsters develop an addiction to their cell phone and feel a group pressure to remain connected and reachable around the clock. However, sleep that is consistently interrupted results in a decreased ability to focus on daily activities, such as school work or sports. Teens often become irritable when sleep derived. A habit of turning off the cell phone before bed allows your teen to maintain a regular sleep schedule while realizing that a cell phone need not become the center of her social universe. Your teen may rely on texting as his primary means of communication, but doing so can be stressful. According to psychologist Suzanne Phillips, writing for PBS, texting is instantly gratifying but it's also anxiety producing. The instant connection can cause feelings of elation and self-value only to be replaced by the disappointment of no response, a delayed response or the misinterpretation of a short or seemingly curt response. Waiting for an expected text response can be stressful for a teen involved in a romantic relationship. Sending sexually inappropriate texts and photos is often damaging to a teen's reputation. Setting clear boundaries on appropriate texting and explaining that written words are open to interpretation can reduce the anxieties that often accompany regular texting. Teens are more likely than adults to respond to texts and calls while driving. Just picking up the cell phone to glance at a text can cost your teen his life. According to the U.S. Government Website for Distracted Driving, traffic crashes are the leading cause of death for American teens, and when it comes to distracted driving, young people are among the most likely to text and talk behind the wheel. Teens can curb the impulse to use their cell phone while driving if they turn off it off -- and leave it off until they reach their destination. Conclusive evidence doesn't exist that cell phones cause cancer; however, research shows that cell phones do emit radio-frequency energy (electromagnetic radiation), which can be absorbed by tissues where the phone is held. According to research at the National Cancer Institute, if research ever shows conclusive evidence that cell phone use can be a risk for cancer, children may have the potential to be at greater risk than adults for developing brain cancer from cell phones. Their nervous systems are still developing and are therefore more vulnerable to factors that may cause cancer. Make your teen aware that short to moderate cell phone conversations may reduce the possible risk of cancer. For example, limit conversations to a total of 20 minutes a day and use a land line for extended conversations.